Makers of cars, planes, buses - anything that needs strong, lightweight and heat resistant parts - are poised to benefit from a new manufacturing process that requires only a quick touch from a small heat source to send a cascading hardening wave through a polymer. Researchers at the University of Illinois have developed a new polymer-curing process that could reduce the cost, time and energy needed, compared with the current manufacturing process. The findings, reported in Nature, state that the new polymerization process uses 10 orders of magnitude less energy and can cut two orders of magnitudes of time over the current manufacturing process. 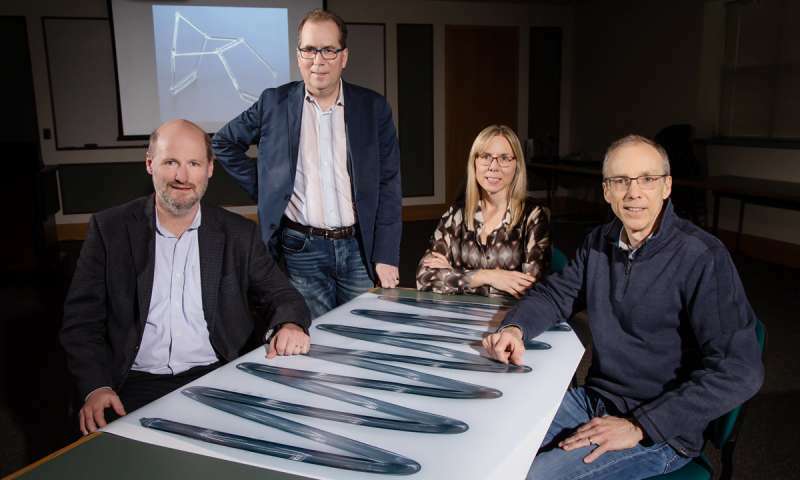 "This development marks what could be the first major advancement to the high-performance polymer and composite manufacturing industry in almost half a century," said aerospace engineering professor and lead author Scott White. "The materials used to create aircraft and automobiles have excellent thermal and mechanical performance, but the fabrication process is costly in terms of time, energy and environmental impact," White said. "One of our goals is to decrease expense and increase production." Take, for example, aircraft assembly. For one major U.S. producer, the process of curing just one section of a large commercial airliner can consume over 96,000 kilowatt-hours of energy and produce more than 80 tons of CO2, depending on the energy source, White said. That is roughly the amount of electricity it takes to supply nine average homes for one year, according to the U.S. Energy Information Administration. "The airliner manufacturers use a curing oven that is about 60 feet in diameter and about 40 feet long - it is an incredibly massive structure filled with heating elements, fans, cooling pipes and all sorts of other complex machinery," White said. "The temperature is raised to about 350 degrees Fahrenheit in a series of very precise steps over a roughly 24-hour cycle. It is an incredibly energy-intensive process." The team is part of the Beckman Institute for Advanced Science and Technology at the University of Illinois at Urbana-Champaign and includes White, chemistry professor and Beckman Institute director Jeffrey Moore, aerospace engineering professor and department head Philippe Geubelle, and materials science and engineering professor Nancy Sottos. They proposed that they could control chemical reactivity to economize the polymer-curing process. "There is plenty of energy stored in the resin's chemical bonds to fuel the process," Moore said. "Learning to unleash this energy at just the right rate - not too fast, but not too slow - was key to the discovery." "By touching what is essentially a soldering iron to one corner of the polymer surface, we can start a cascading chemical-reaction wave that propagates throughout the material," White said. "Once triggered, the reaction uses enthalpy, or the internal energy of the polymerization reaction, to push the reaction forward and cure the material, rather than an external energy source." "You can save energy and time, but that does not matter if the quality of the final product is substandard," Sottos said. "We can increase the speed of manufacturing by triggering the hardening reaction from more than one point, but that needs to be very carefully controlled. Otherwise, the meeting spot of the two reaction waves could form a thermal spike, causing imperfections that could degrade the material over time." The team has demonstrated that this reaction can produce safe, high-quality polymers in a well-controlled laboratory environment. They envision the process accommodating large-scale production due to its compatibility with commonly used fabrication techniques like molding, imprinting, 3-D printing and resin infusion.